One of the loveliest embroidery designs in our Christmas collection, this one will be a tremendous addition to your holiday decoration project! It features an adorable beige bunny decorating a snowman for Christmas. The snowman is already dressed in a colorful hat and a warm scarf. He even has some small presents. The bunny is about to decorate the snowman with a berry garland. 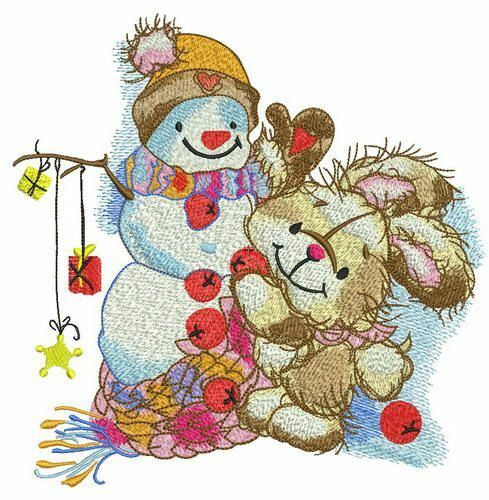 This heartwarming winter design will come as a wonderful decoration for a variety of Christmas presents and home decor items: blankets, quilts, sweaters, towels, bathrobes, bed linen, pajamas and much more !